NEWS | SAVE KILKENNY | This website is for people who passionately care about Kilkenny, its medieval heritage and natural environment. On Monday the Fianna Fáil and Fine Gael dominated Council voted through a resolution that effectively removed any public ownership of viable development sites within a key brownfield site (the brewery site). The resolution as adopted will hand over our interest in development ‘blocks’ to a joint management structure with the National Treasury Management Agency (NTMA) for commercial gain and commercial return. The potential impact on the town centre of Kilkenny is incomprehensible, but equally important is the damage to the integrity of public participation in decision making and trust in the Council to take cognisence of such processes. This was followed later in the day by a packed public meeting in the Home Rule Club, organised by Save Kilkenny, where we heard of the disappointment and anger at the decision. 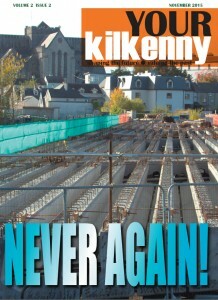 Re my email of 7 Oct, I wish to confirm that the project in Kilkenny is fully commercial in its objectives and that it will seek to establish a business, enterprise, education and research campus at the site of the former Smithwicks Brewery and seek build out some 7 site blocks for this purpose over a number of years. Yet this public meeting offers some hope for the future. By the size of the attendence, there are indeed many, many people who are gravely concerned about what is happening to Kilkenny. There are many issues still to be addressed, and high among these is the push to have all council meetings streamed live. Sign the petition ! Click Here ! We will continue to post more information and videos on these meetings as soon as possible, and will update on the Brewery development as things happen, so stay tuned! The latest edition of “Your Kilkenny” magazine has been issued and paper copies have been distributed on the streets of our city. It is hard-hitting and makes for compelling reading. “Unelected officials treated the people with contempt. It can’t happen again” implores the Cover Story. The cost of the CAS project to date has escalated phenomenally and no answers have been forthcoming from Kilkenny County Council. The same council has strict rules inside its chambers and no recording devices or cameras are allowed. Save Kilkenny supports the call for more openness and transparecy in local government. Enough of this veil of secrecy.